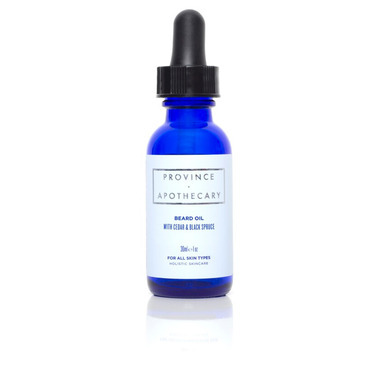 Province Apothecary Beard Oil gives your beard a healthy shine while hydrating the skin and reducing irritation. All Province Apothecary products are free of fillers, pesticides, dyes, petroleum, synthetic chemicals + fragrances, GMOs, and animal testing. Directions: Shake oil before use. Mix 6-12 drops of Beard Oil with equal parts water* in your palm and apply to neck and face in upward circular motions. Wait 2-5 minutes for oils to absorb. *Water allows the serum to spread easily and evenly. This product is undiluted, preservative-free and vegan. Province Apothecary enriches the serum with GMO-free Vitamin E to prolong the lifespan of the product. They recommend using this product within 12-24 months. Maybe they've changed the scent, but I detect mostly Lavender with almost a minty undertone rather than woodsy. The oil is high quality and works well. The scent is invigorating. Love it!! Smell can be overwhelmingly woodsie. Unlike other beard oils, this one has a scent that lingers all day - which is really nice if you like the scent. I find it okay, better than the tobacco varieties. It smells more like 'I am a really old forest' than 'I am a little woodsman'.